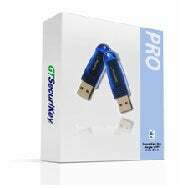 If you’re a mobile Mac user who frets about the chance that someone might swipe your laptop and make off with all the important data stored in side, there’s at least one option open for consideration: look into investing in GT SecuriKey’s SecuriKey Professional Edition for the Mac. The hardware-software combo serves as a kind of key for your laptop—install the software and insert a USB key into the port on your Mac to make it run. No key? Then, no one can access your data, with or without a password. Ah, but what happens if you’re a mobile Mac user who not only frets about the possibility of laptop theft but also uses Leopard’s built-in Boot Camp feature to run Windows on your MacBook? That USB key would lock up your Mac data, but anything on the Windows partition would be fair game for a laptop thief. GT SecuriKey has you covered there, too. On Monday, the company released the SecuriKey Pro Boot Camp Bundle. The new security offering features SecuriKey software for both Mac OS X and Windows and two software licenses. Like other SecuriKey products, the Boot Camp Bundle comes with two USB keys—one of them’s a spare key in case you lose the first one. But a single USB key unlocks both the OS X and Windows partitions on your laptop. “It leverages everything good about the MacBook, regardless of which platform you’re using,” GT SecuriKey founder Bennett Griffin said. The SecuriKey Pro Boot Camp Bundle supports both XP and Vista partitions (and works with OS X 10.5, obviously). It costs $180.